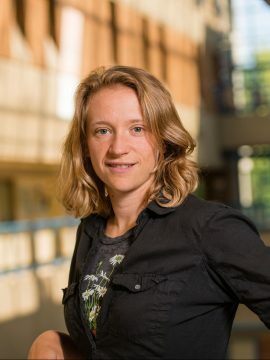 Kristin is an Associate Professor of Psychology at the University of British Columbia. She arrived at UBC after studying at McGill University and at the University of Waterloo, and as a faculty member at the Stanford Graduate School of Business. Dr. Laurin's research investigates how people’s goals and motivations interact with their beliefs and ideologies – about politics, about religion, or about the nature of the world. For example, she asks questions like what motivates people to support the principle of democracy, even when doing so goes against their own interests? Or what do we do when we’ve done something that we know is wrong? Why is it that the social standing you’re born with is most likely the social standing you’ll die with? And how do people go about convincing themselves that the world they live in is fair? Laurin, K. (2017). Belief in God: A cultural adaptation with important side effects. Current Directions in Psychological Science, 26, 458-463. Kreps, T. A., Laurin, K., & Merritt, A. C. (2017). Hypocritical Flip-Flop, or Courageous Evolution? When Leaders Change Their Moral Minds. Journal of Personality and Social Psychology, 113, 730-752. Friesen, J. P., Laurin, K., Shepherd, S., Gaucher, D. & Kay, A. C. (in press). System justification: Experimental evidence, its contextual nature, and implications for social change. British Journal of Social Psychology. Kupor, D., Reich, T., & Laurin, K. (in press). The (bounded) benefits of correction: The unanticipated interpersonal advantages of making and correcting mistakes. Organizational Behavior and Human Decision Processes. Laurin, K., Kay, A. C., & Landau, M. J. (in press). ML2 Commentary: Structure and goal pursuit: Individual and cultural differences. Advances in Methods and Practices in Psychological Science. Laurin, K., Engstrom, H., & Alic, A. (in press). Motivational accounts of the vicious cycle of social status: An integrative framework using the United States as a case study. Perspectives in Psychological Science. Brulin, J. G., Hill, P. C., Laurin, K., Mikulincer, M., & Granqvist, P. (in press). Religion vs. the Welfare State: The importance of cultural context for religious schematicity and priming. Psychology of Religion and Spirituality. Jago, A., & Laurin, K. (in press). Inferring commitment from rates of organizational transition. Management Science. Laurin, K. (2018). Inaugurating rationalization: Three field studies find increased rationalization when anticipated realities become current. Psychological Science, 29, 483-495. Khenfer, J., Laurin, K., Tafani, E., Roux, E., & Kay, A. C. (2017). Interventionist external agents make specific advice less demotivating. Journal of Experimental Social Psychology, 73, 189-196. Nakashima, N., Daniels, D., & Laurin, K. (2017). It’s about time: Construal level and restrictive policies. Organizational Behavior and Human Decision Processes, 142, 12-27. Jago, A., & Laurin, K. (2017). Corporate personhood: Lay perceptions and ethical consequences. Journal of Experimental Psychology: Applied, 23, 100-113. This is a list of recent representative publications; for a full list see the lab website. View Dr. Laurin's Google Scholar profile.